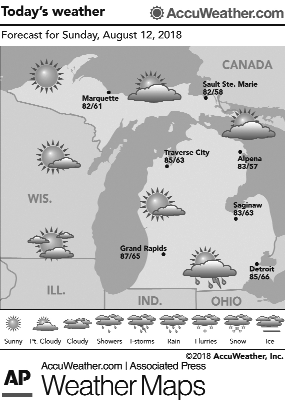 Marquette and vicinity: Today, patchy fog before 10 a.m. Otherwise, sunny, with a high near 77. Calm wind becoming east around 5 mph in the afternoon. Tonight, clear, with a low around 63. Southeast wind 5 to 10 mph becoming southwest after midnight. Monday, sunny, with a high near 84. Southwest wind 5 to 10 mph. Monday night, mostly clear, with a low around 67. Southwest wind around 10 mph. Tuesday, a 40 percent chance of showers after 2 p.m. Increasing clouds, with a high near 77. Tuesday night, a 30 percent chance of showers. Mostly cloudy, with a low around 58. Extended forecast: Wednesday, a chance of showers before 2 p.m. Mostly cloudy, with a high near 64. Wednesday night, a chance of showers after 2 a.m. Partly cloudy, with a low around 54. Thursday, a chance of showers before 2 p.m. Mostly sunny, with a high near 69. Thursday night, partly cloudy, with a low around 57. Friday, sunny, with a high near 75. Friday night, mostly clear, with a low around 58. Saturday, a chance of showers. Mostly sunny, with a high near 73. Lake Superior: Today, variable wind less than 10 knots becoming east less than 10 knots in the afternoon. Sunny. Waves calm to 1 foot. Tonight, southeast wind less than 10 knots veering south after midnight. Clear. Waves building to 1 to 2 feet. Monday, south wind less than 10 knots becoming 5 to 15 knots by mid afternoon. Sunny. Waves calm to 1 foot. Temperatures: The average temperature Saturday at the National Weather Service office in Negaunee Township was 67 degrees, 2 degrees above normal. The high Saturday was 76 degrees and the overnight low was 58 degrees. Precipitation: Saturday, .12 inches. Year to date, 20.41 inches. Normal to date, 25.06 inches.